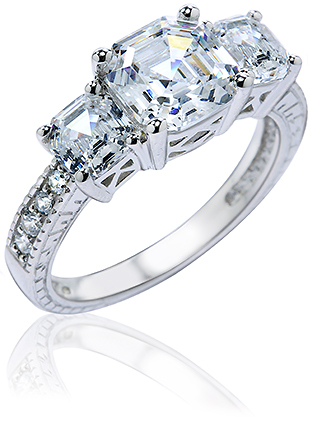 Our Aaricia Three Stone Asscher Cut Cubic Zirconia Engraved Estate Style Anniversary Ring features a 1.5 carat 7mm asscher cut inspired center stone is set with a .75 carat 5mm each asscher cut cz stone on each side. 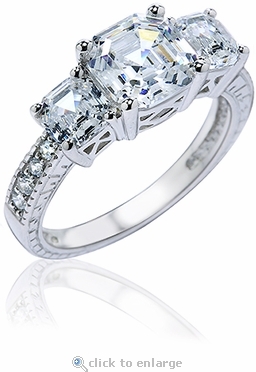 Additional prong set diamond look cz rounds line halfway down both sides of the shank. 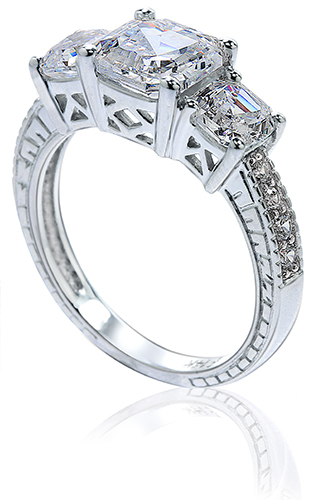 This ring is an amazing value when you see the fact that it has three of our premium cut asschers along with all the beautiful detailing on the ring itself. You will notice the decorative lattice work in the galleries beneath the three main stones along with engraved detailing. The band measures approximately 2.85mm at its widest point and includes approximately 3.25 carats in total carat weight. The asscher cut stone features step cut faceting that is hand cut and hand polished by our diamond cutters, revealing a stunning stone that will rival even the best of asscher cut diamonds that are available.